Much like his billionaire mentor, Robin will be sporting a wide range of duds in the upcoming Batman: Arkham City, though exactly what he wears will depend on which retailer gets your pre-order cash. Those of you who are eagerly lapping up every snippet of information regarding the upcoming Batman: Arkham City will no doubt recall our story on the various outfits the Dark Knight can potentially wear in the upcoming action title. You may also recall that you earn these new costumes by pre-ordering the game from various retailers. Each store has their own pre-order bonus, and as far as we know, that's the only way to gain access to the extra costumes. As it turns out, Bats isn't the only one in on this lucrative scheme. His protÃ©gÃ© Robin also features retailer-specific clothing. So far only three of Robin's extra looks have been revealed. 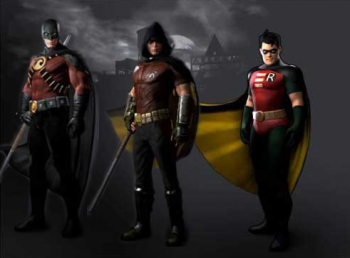 It's unknown if this is the sum total of alternate Robins, though it should be noted that Batman has six extra costumes. Still, what it lacks in quantity, the aesthetic options here more than make up for in quality. Red Robin is a neat addition, and that Batman: The Animated Series look is a perfect match for the similarly styled Batman outfit from the same beloved Paul Dini/Bruce Timm series. These images come courtesy of Amazon Germany, so though they are seemingly official, it is also entirely possible that other retailers have access to additional getups. Presumably we'll be hearing more about that soon. In the meantime, feel free to fill the comments with petulant whining that your favorite Robin look isn't included in that above image. I'm counting down the seconds until one of you mentions Nightwing -- Elseworlds vampire or otherwise.